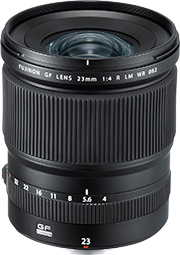 Super wide-angle lens for scenery and architecture. 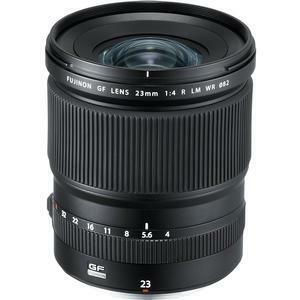 The Fujifilm GF 23mm F4 R LM WR is a super wide-angle lens specifically designed for the Fujifilm G Mount and 43.8 x 32.9mm sensor. With a focal length equivalent to 18mm in the 35mm format, it is perfectly suited for landscape and architectural applications. 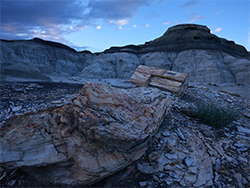 Despite the super-wide angle of view, distortion is kept to a minimum, and with the high-resolution performance extending all the way to the edges, sharp depiction power as if looking at an actual landscape is achieved. 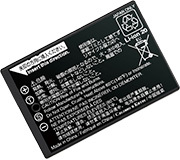 It features fast and quiet AF due to a linear motor, is dust and weather resistant, and is capable of operating in environments as cold as 14° F (-10°C). 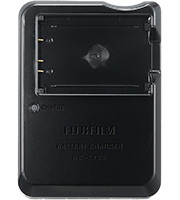 The lens combines high performance and reliability as a professional work tool. 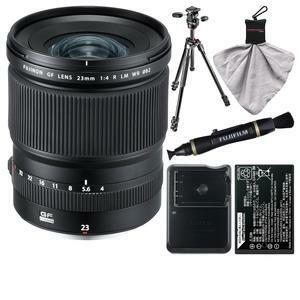 This super wide-angle lens with a focal length equivalent to 18mm in the 35mm format offers optimal performance for shooting landscapes and architectural photography. 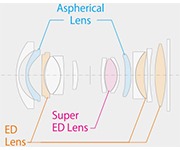 Using a combination of aspherical lenses, super ED lens, and ED lenses, this high image quality lens limits chromatic aberrations by arranging the elements in a well-balanced manner before and after the aperture. 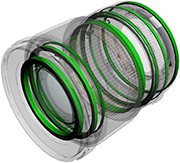 With a 12 groups and 15 elements construction using two aspherical lenses, one super ED lens, and three ED lenses, this lens suppresses distortion despite being a super wide-angle lens with a 99.9° angle of view. Also, thanks to the optimal arrangement of the Super ED lens and three ED lenses, chromatic aberration of magnification is thoroughly suppressed, achieving high resolution performance all the way to the edges. 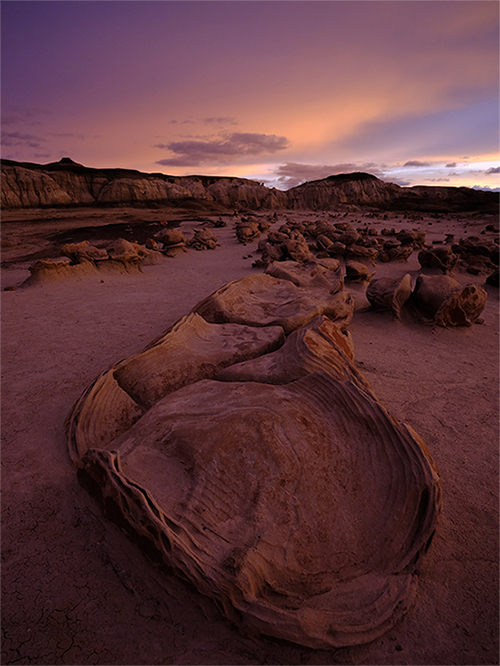 The lens has been sealed in nine areas, allowing you to shoot outdoors in wet, cold or dusty conditions. 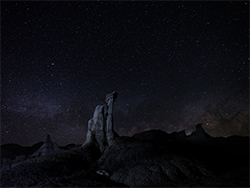 Create epic photography regardless of cold weather (14 degrees F / -10 degrees C), dusty environments and in light rain outdoors. 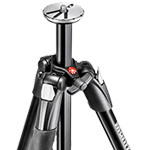 A lightweight, compact, high-quality tripod. 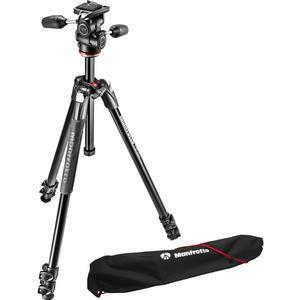 The Manfrotto 290 Xtra 67" Professional Tripod has the combination of sturdiness and innovative high-end technical features that make this the ideal solution to any hobbyist photographers looking for more creative freedom with their shoots. It features aluminum leg tubes and a special top casting for enhanced rigidity, durability and performance. 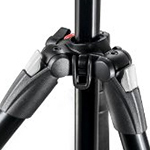 Its aluminum leg-locking levers are tension-adjustable, so they can be tightened to counteract any effects of aging and wear, keeping the tripod fully functional throughout its long lifespan. 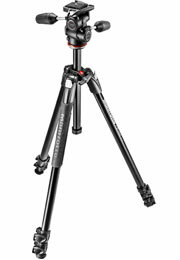 This tripod's key feature is its choice of four leg angle positions which maximize shooting creativity. Its rapid center column adds flexibility and extends the min/max height range. 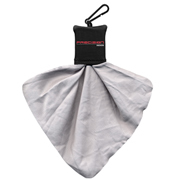 A rubber legwarmer guarantees comfortable grip and maximum ergonomics. 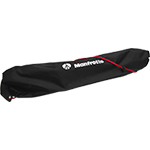 The tripod even comes with a dedicated shoulder bag ensuring comfortable portability at all times. This 290 Xtra Kit also comes with an updated 804 3-way head with quick release plate, specifically designed for compactness and portability. 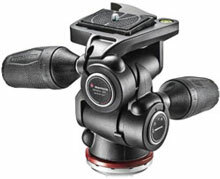 This patented head ensures precise framing and solid support of medium-heavy camera equipment. 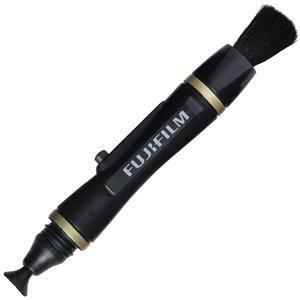 The key feature of this head is its retractable levers which fold away when not in use, making it more compact for easier portability. Its ergonomic handles are made of special, grip-increasing rubber. 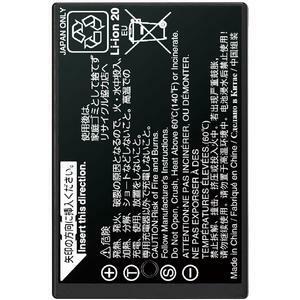 The three-way head is made of Adapto, a lightweight polymer which keeps weight low while ensuring high mechanical resistance for sturdy support.